See all of the possibilities! Rebo solutions for clear machine identification! Riveted metal plates, rust and cost problems will be a thing of the past. Using our high performance metallic polyester plate material, you can create and print machine plates, serial number plates and equipment plates quickly, easily and at a significantly lower cost and delivery time. No need to emboss details or engrave details any more – a Rebo System will print the complete plate, with all the required information, legibly and durably in second. Our material has gloss and matt face options and an extra strong adhesive to ensure they stay where you place them. Product labels have the appearance and quality of metal, but are easy to read, easy to produce and give you total flexibility to change the design, content and size of your machine plates when you want to. No pre-made plates held on stock, no expensive waste when you change the plate design or layout. 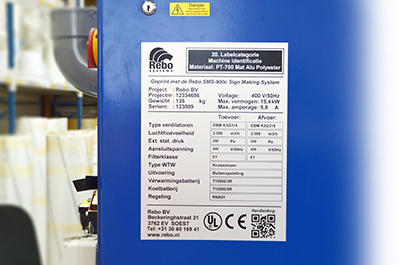 Industries including car manufacturing, oil and gas, transport and maritime are already using Rebo’s plate label solutions and experiencing increased efficiency and reduced costs. A type plate or machine plate usually contains a lot of important information and therefor should not be removed. 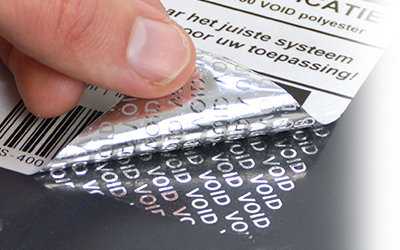 For this application we offer a number of solutions including defragmenting labels or the so-called VOID labels which leave the word “VOID” whenever someone tries to remove the label. Press the button below if you wish to receive more information.